The French invented the European MPV market, and Citroen has always had a leaning towards comfortable, passenger-centric cars, so in theory this is one part of the market that Citroen should excel at. The Grand C4 SpaceTourer benefits from PSA’s latest platform which offers significant packaging and weight advantages. The net result for you is more space inside, less bulk outside, and an impressively low kerb weight, helping to deliver excellent fuel consumption. The most important aspect of any MPV is its ability to move lots of people in comfort. By this measure the Grand C4 SpaceTourer is excellent. Interior space is very good and the occasional third row of seats is usable. There is a great sense of airiness helped no end by the huge amount of glass and the standard ‘panoramic’ windscreen. 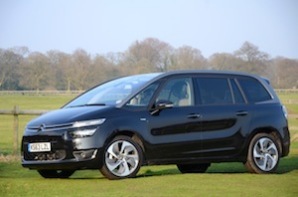 Although practicality is absolutely key, MPV buyers are increasingly looking for style too. The front end is certainly individual, regardless of whether you like the styling. The side aspect is more tame but not a bad effort, whilst the rear gives a sense of solidity, although we do have our suspicions that the tailgate ended up being so big just to fit the model name badges on. The Grand C4 SpaceTourer is a welcome addition to the market offering quirkiness, efficiency and practicality in a distinctive package. If we’re being picky, the dashboard looks good but the central location of the main instruments is just silly. We have never liked instruments here and this hasn’t changed our minds!